The U.C.A. now supports MOS 6502! Since the end of last year, I faced a lot of change in my personal life: new job, new house, new car, etc. Except my girlfriend, almost everything else changed in the last 3 months. Damn exciting, but I had very little time to spend on side projects. It’s now time to resume the work on the Universal Chip Analyzer! 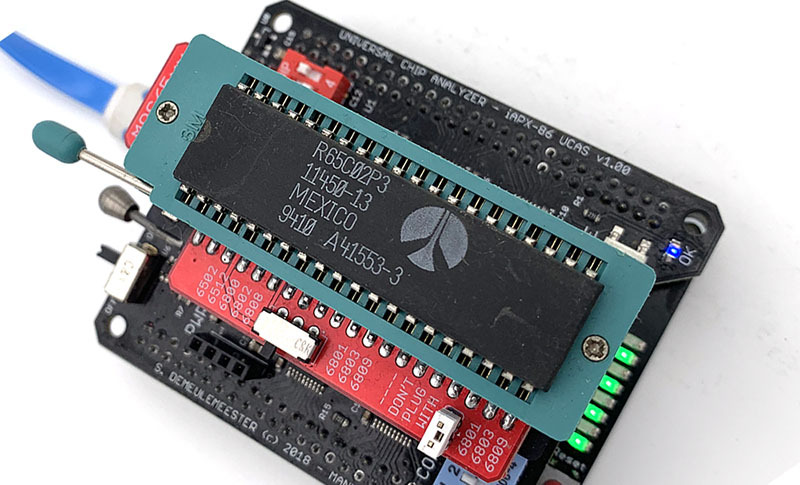 My next goal was to add support for the very successful MOS 6502, an 8-bit microprocessor released in mid-70s that was at the heart of many designs well into the 80s. The original 6501 (circa 1975) was pin-compatible with the M6800 while being much less expensive, but Motorola sued MOS almost instantly and the 6501 has been withdrawn very quickly. The 6502 shares the same internal micro-architecture with the original 6501 but uses a different pin arrangement. 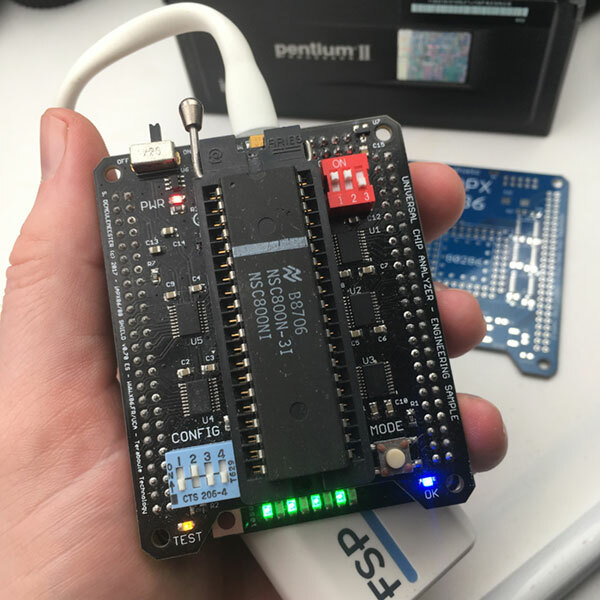 It’s a very simple CPU, with a 8-bit accumulator, two index registers and a 16-bit address bus (able to interface with a maximum of 64 KB of memory). The 6502, just like many other early CPU, doesn’t have a specific way to handle I/O: you must define an arbitrary memory-mapped I/O range and configure your hardware accordingly. Several variants of the MOS 6502 has been launched through the decade, some of the them with reduced addressable memory (6503 to 6507) and some others with additional features (6508 to 6510, …). Many early computers and consoles are based on a 6502: Apple IIe, Commodore 64, Atari 2600, Nintendo NES, Oric Atmos, etc. Adding support for the 6502 wasn’t as easy as I expected. The main issue came from the timings. Usually, I drive all the logic inside the FPGA with the the clock signal generated locally and sent to the CPU. That doesn’t work with this particular CPU because it integrates an internal two-phase clock generator used to sync external IC. So, I finally had to feed these two clocks back in the FPGA and sync the internal logic with them. Some delays were needed to match the original timings (FPGAs hate delays) but everything now seems to work properly. I’m waiting to get some samples to support other 6502-based CPU like 6510 or 28-pin 6503 -> 6507. A Rockwell 65C112 has already been seen working properly. The passive adapter isn’t final now, because I still need to work on my next goal: the Motorola 6800! This CPU Is the last (but not least) big one I need to support with the UCA. Stay tuned! Posted: Author Doc TBPosted on 2018-10-12 2018-10-12 Categories Various1 Comment on Pace è Salute ! Le numéro 38 de Canard PC Hardware marque la fin de mon règne despotique en tant que rédacteur en chef irascible : je quitte Presse Non Stop après 13 ans de journalisme total et plusieurs centaines d’articles scandaleux qu’aucun éditeur raisonnable n’aurait jamais dû accepter de publier. J’en profite également pour faire mes adieux à la presse en général. 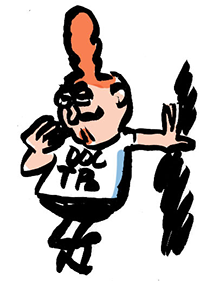 Avant de rendre ma carte de journaliste, je voulais vous remercier sincèrement pour ces presque 10 ans où vous m’avez suivi sur CPC Hardware voire – pour les plus vieux d’entre vous – depuis 2001 sur x86-secret.com. Je souhaitais aussi vous expliquer une partie des raisons qui m’ont mené à cette décision. The U.C.A. now supports Intel 8080 ! 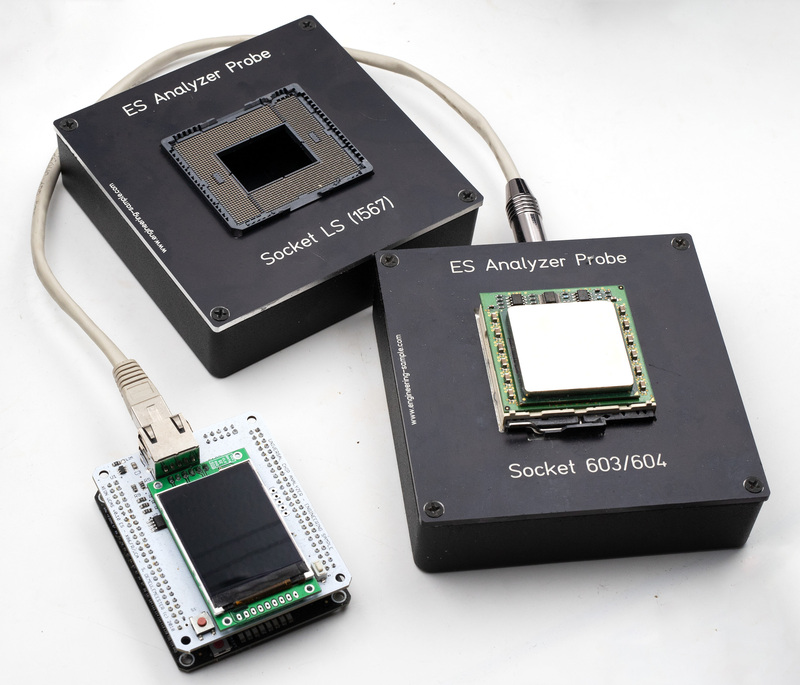 A new milestone for the Universal Chip Analyzer (U.C.A.) : it now supports Intel 8080s, one of the very early CPU released by Intel in 1974! 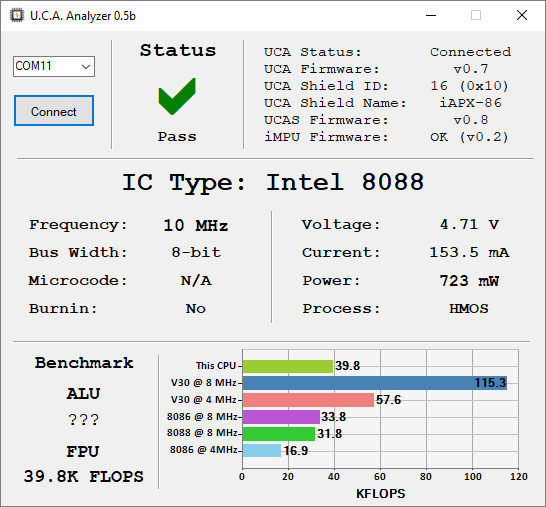 I originally planned to create a complete UCAS (UCA Shield) to support the 8080, but I was finally able to design a small UCA Adapter for the iAPX86 UCAS. 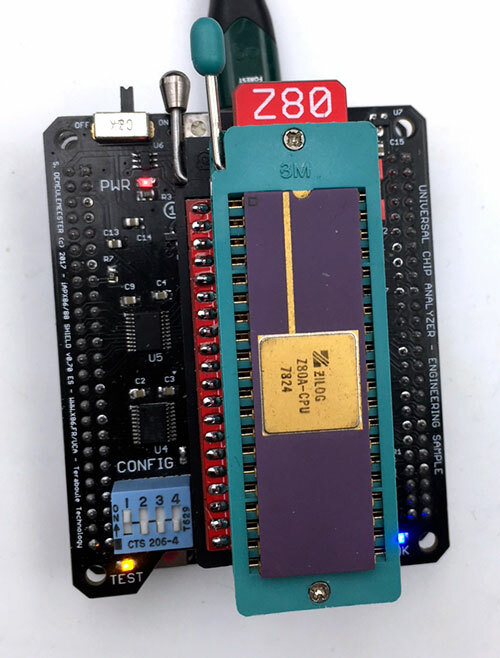 This is the first “active” UCA adapter (both the adapters for Zilog Z80 & Signetics 2650 are only passive). The biggest issue with the 8080 was the power requirements : unlike all CPU supported so far by the UCA, the 8080 doesn’t work with a single +5V supply rail. It also needs +12V & -5v. +12V has been created from +5V with a TI DC-DC Boost Converter and -5V is generated using a charge-pump IC. Some signals like the two-phase clock are also not TTL compatibles and requires a true MOS voltage swing (0-12V). For the first alpha prototype, I tried some high-speed transistors as voltage translators, but I wasn’t able to meet the tight rise/fall time (~25 ns) expected by the 8080. I then tried a Dual MOSFET driver and it worked perfectly. All components are packed on a tiny adapter the size of the previous passive ones. The expected “retail” price for the 8080 UCAS Adapter is ~$25. Stay tuned for the next big announcement! 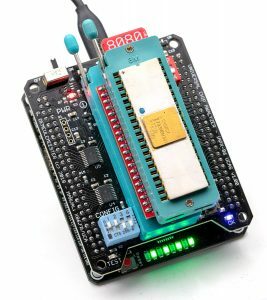 About the UCA itself (modded Mojo v3 board), I found a reliable source for assembled board and they will be modified soon. All firmware features are now implemented and working correctly. UCA FW v1.00 is close. About the iAPX86 UCAS, a first batch has been ordered from Elecrow, but they soldered a wrong component on them (well, 50+ wrong components). So I had to send back the whole batch to China. Unfortunately, the package now seems frozen somewhere in China! Tracking is EW001348809FR if you want to check… If it get lost, I will lose $400 and I’ll have to order another batch. Sad. Anyway, when I got the package from Elecrow, they added two unsoldered PCBs, so I was able to assemble one of them myself to validate the final 1.00 PCB. Good news: everything is working correctly! Signal integrity is much better than on ES/QS, up to 50 MHz, and all hardware bugs are solved. VERY good news. I tested quickly the new expansion port (dedicated for future uses) and it also works as expected. I’m working on a new UCAS Adapter for the Intel 8080. The goal is to use the iAPX86 Shield to test Intel 8080. 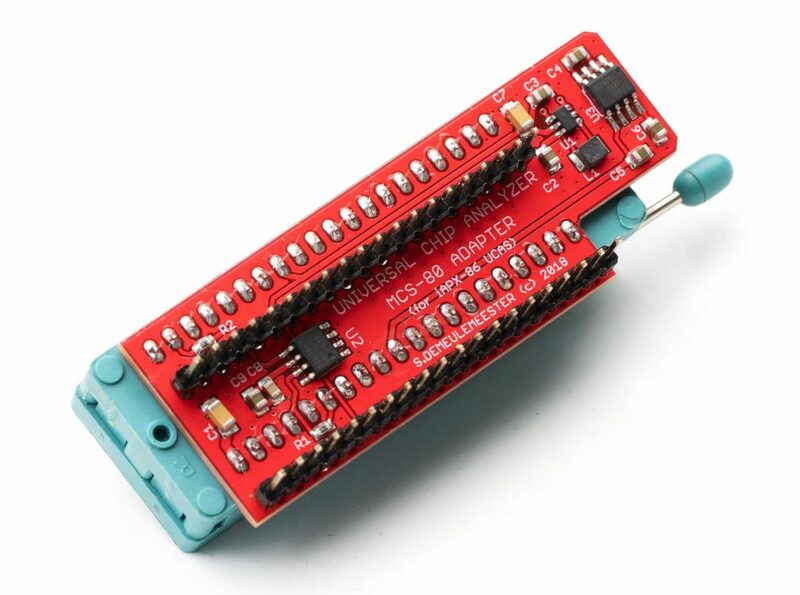 They requires +5/+12 & -5V, so the Adapter will be an active adapter, but the 8080 is TTL compatible. The design is done and proto PCB will be ordered soon. The MOS/MOT UCAS for Motorola 68xx & MOS 65xx CPUs. There is no real technical difficulties on this one from the tech side. The MCS-4/-40 UCAS for Intel 4004 & 4040. LOT of technical challenge here. Interfacing a 45+ years old PMOS CPU that requires -10V/+5V with a modern 3.3V FPGA is quite hard. Especially while using ONLY modern ICs. I’m still working on the schematics right now, messing with comparators, zeners and transistors. The HDL code will not be easy, but I have some ideas. 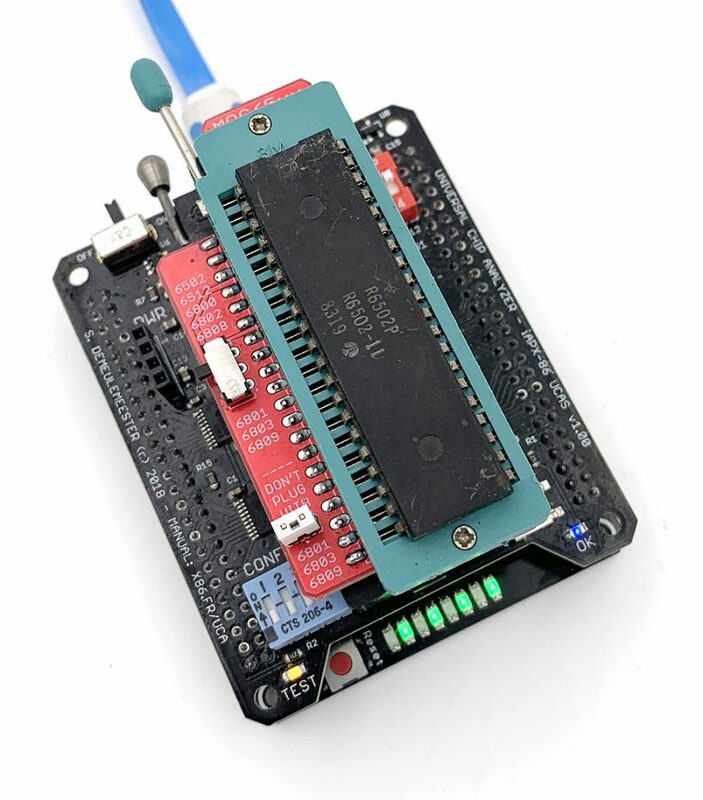 A new “Universal PGA Shield” (UPGA). 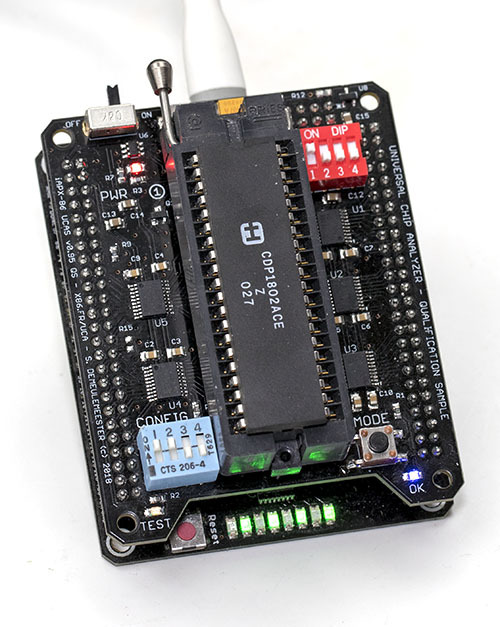 I finally decided to cancel the iAPX-286 Shield that I already showed working on early stages. Why? Because having a 286 UCAS, a 386 UCAS, then a 486 UCAS and another 486 3.3V UCAS, and another 68000/68010/68020/etc. UCAS will be expensive. The UPGA UCAS will support all of them at once, with (quite cheap) interchangeable Sockets. The design have been done, focusing on the fastest 486DX/DX2/DX4. If my design works for them (not proven right now), it will also works with all slower CPUs like 386 or 286. Schematics are done and a nice 4-layer PCB has been designed. It’s a very complex PCB, so I don’t expect the Rev 0.10 to work without massive rework. Fingers crossed! 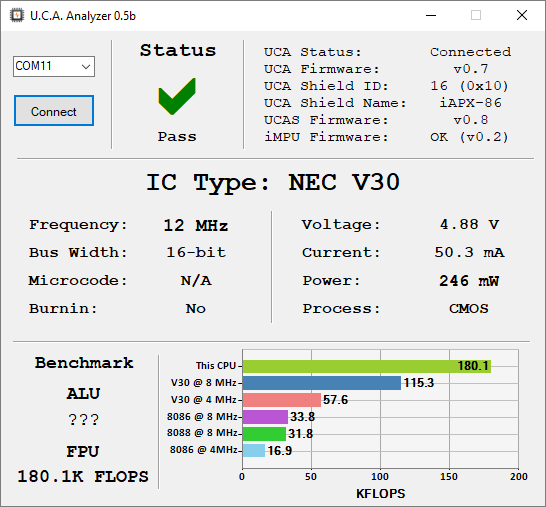 Now, let me introduce another concept for the UCA : the Xeon ID UCAS! 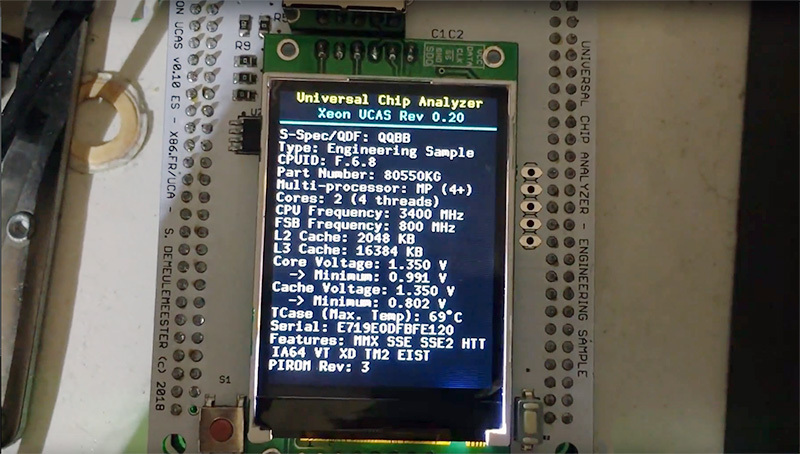 I have big plans for the Universal Chip Analyzer as a truly “Universal” chip analyzer, and this is one of them. Xeons are sometimes hard to identify, especially Engineering Sample (ES are often unmarked, available in various flavor with the same part number, or unknown in databases). Xeon motherboard are also a nightmare to work with, expecting exotic RAM, 2- or 4- CPUs, with BIOS restricted to a few S-Spec. Fortunately, “True” Xeon – like MPs but not the rebranded Desktop CPUs – comes with an embedded “PIROM” chip, used by the motherboard to check their specs without booting the whole CPU. The “Xeon ID UCAS” uses that PIROM to ID the unknown Xeon. The Shield interfaces with Socket probes to connect with the CPU. Right now, I have a working Socket 603/604 Probe and a LGA1567 Probe, but the UCAS should also work with Pentium II/III Xeon (Slot 2) and up to modern Xeon (LGA2011/3467). Some weeks ago, I fried a nice 486 motherboard I got in a scrap lot at first boot. Some capacitors were shorted and my ATX PSU, coupled with a regular passive ATX2AT adapter, led to massive damage (burnt traces). That short was not “short enough” to trigger the (very large) PSU overcurrent protection. The motherboard was FUBAR by the time I noticed something went wrong and manually switched off the power (within 3/4 seconds). So, while waiting for the first batch of Universal Chip Analyzer being assembled, I created a “Smart” ATX2AT Converter, featuring fully-programmable electronic fuses. I also added a small OLED display for monitoring purpose, a -5V regulator to regenerate that missing voltage (required by some sound cards) and some additional filtering capacitors. 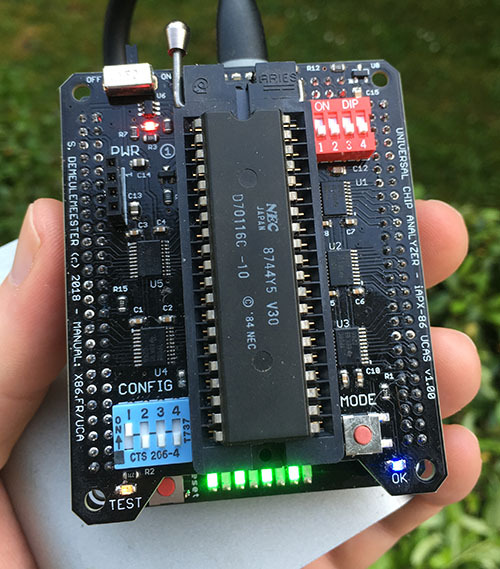 The project will ultimately be open-source and can be adapted for any other retro-platform that require -12/-5/+5 and/or +12V. Some friends already expressed an unexpected strong interest for this adapter. If we’re only a few to want one, I’ll assembled them manually, but if we’re more than a few, I can consider having them built by a fab to reduce costs. The UCA now supports Signetics 2650 ! It’s the last “major” CPU family I wanted to add before release. 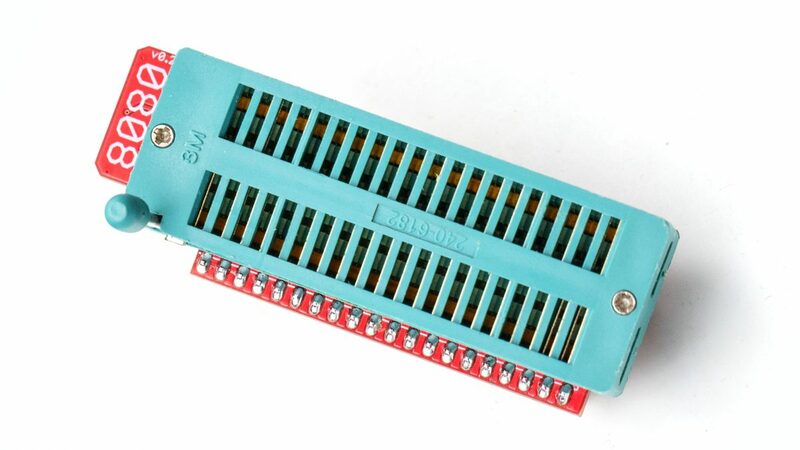 Like for the Z80, it requires a cheap passive adapter on top for the iAPX-86 UCAS. 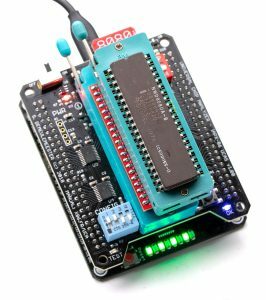 John from CPUSHACK wrote a nice article on this CPU. The U.C.A. 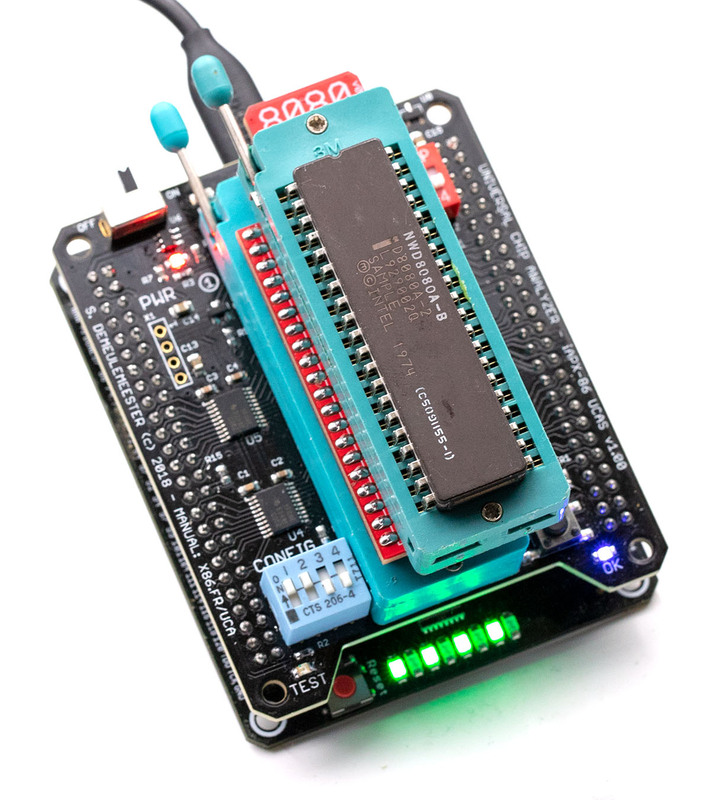 now supports RCA/CDP 1802 “COSMAC” CPUs ! New milestone reached for the UCA ! After days messing with that prehistoric micro-architecture (don’t even have a CALL/RETURN instruction) as well as the VHDL code to implement the tight timings needed, the UCA now supports the RCA CDP1802 (COSMAC) CPU ! BNZ TEST1 ; if R4/D is not zero, loop again, if zero, continue to next test. Testing can be done at 2.5/3.2/4.0 & 5.0 MHz. The interesting part is that it doesn’t require any additional adapter, just a firmware update. I designed an adapter for this chip, but it wasn’t finally required. While developing for the RCA 1802, I found a limitation on the iAPX-86 UCAS’ hardware design : it can’t measure current for this particular IC. The 1802 power consumption is abysmall (< 2 mA) and under the lowest end of the range I choose. The UCAS just can’t reliably measure power-hungry behemoths like the HMOS USSR clones (> 1.5W) and extremely low power chip like the 1802. Not really a big deal.. Anyway, it now works as expected with CDP1802! Right now, I don’t have CDP1804/05/06 but I’ll try to find one of each soon to check if they also works. They should also run fine and I will be able to check their specific features (Internal RAM & extended instruction set). UCA : Advanced Tethered Mode in alpha stage ! Big milestone! 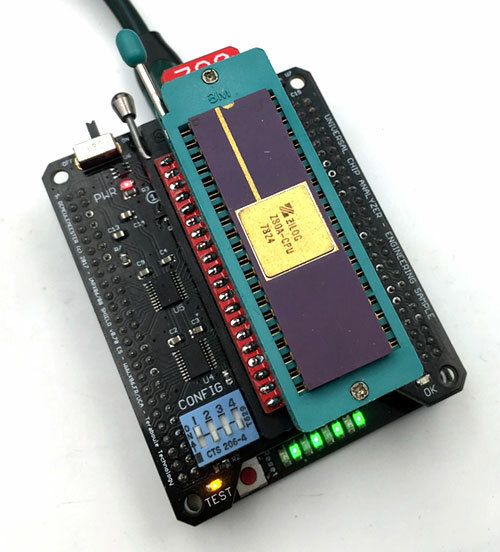 The whole communication between all parts of the UCA (from the MCU synthesized inside the FPGA to the USB port connected on the ATMega) is now working as expected ! I wrote a simple software in C# this night to show how the advanced features will look like. Top-right, you have the current status of the UCA/UCAS with all the embedded firmware version (yep, there is 3 of them!) . 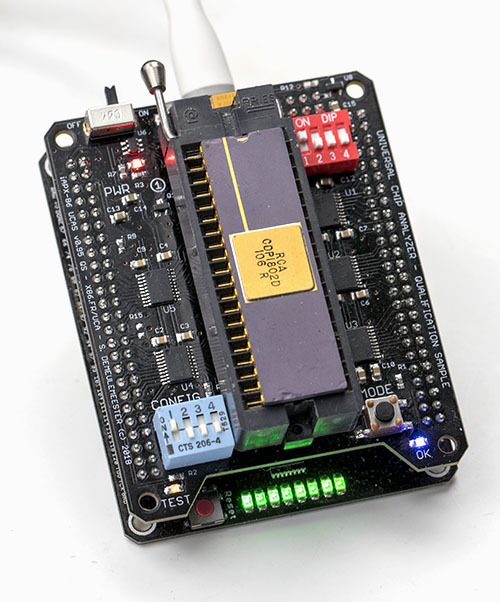 Top-left, the obvious “Connect” Button and the current Status (ranging from “testing” to “Pass” or “Fail” and even “short-circuit”). I worked quite hard on the hardware this month, but it’s now time to switch on software. UCA w/ iAPX86 UCAS now supports National Semiconductors NSC800 CPU family with a firmware upgrade. 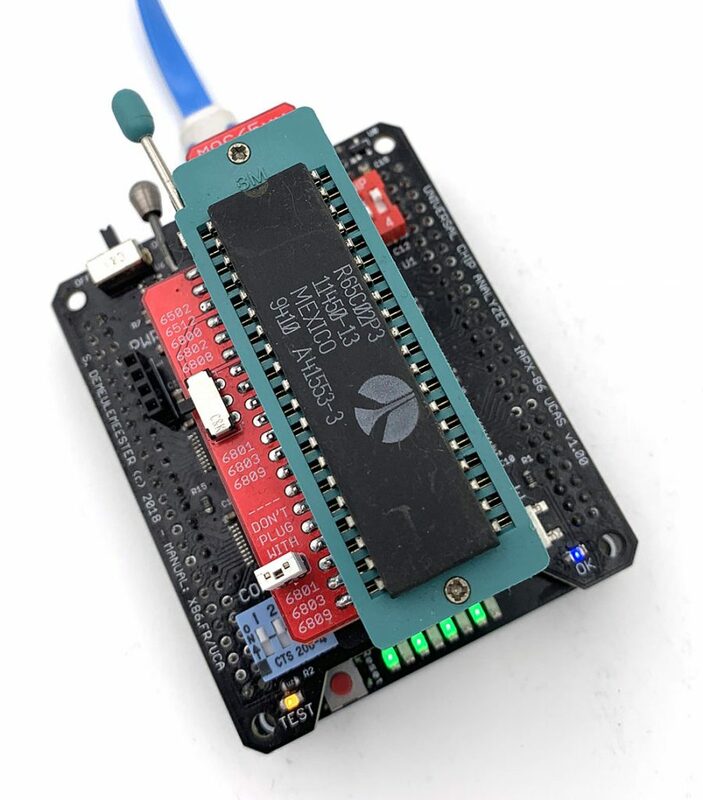 It doesn’t require any adapter, just select the NSC800 Family on the DIP Switch, plug the CPU and voila! Configuration is available for 1.0 MHz (NSC800-1), 2.5 MHz (NSC800-3), 3.5 MHz (NSC800-3.5) and 4.0 MHz (NSC800-4). Let’s introduce the first UCAS Adapter. Some IC families requires a remap of power lines, much harder to implement into the target UCAS then a remap of signal lines. Adding the required hardware to support software power lines remapping on a 40+ pins IC is just too expensive to consider. The solution is a cheap passive adapter (less than $10). 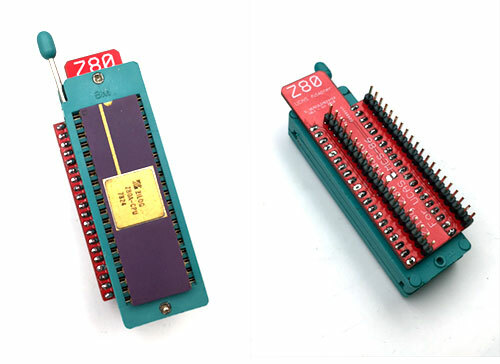 Here is the first one, that add support for Z80 to the iAPX86 UCAS ! The PCB is cut to allow easy manipulation of the underlying Socket’s lever. A clear indication of the family supported is printed on top. 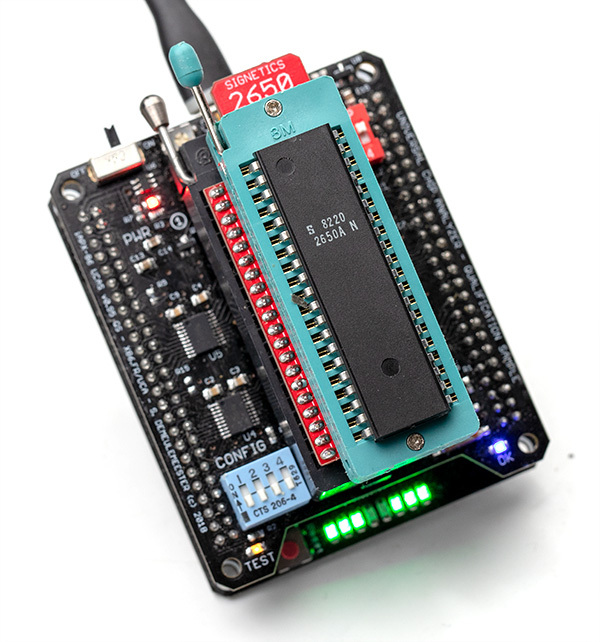 The Shield can be configured for 2.5/4/6 or 8 MHz. 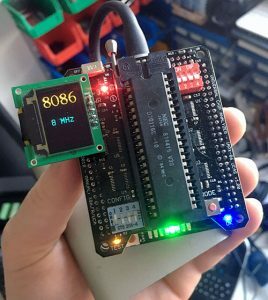 Tested at 8 MHz with a Z80H and working fine!